Today we talk about how to adapt and overcome. And, just like the phrase says you and I, as men, need to anticipate hurdles and learn how to better overcome the adversities we face in life. The more confident I become, the more clear I get, the better I am at adapting to all that life has to throw at me and come back stronger than before. Today I want to talk with you about something that used to tear me up. It’s the concept of adapting and overcoming. And, just like the phrase says you and I, as men, need to anticipate hurdles and learn how to better overcome the adversities we face in life. I’ve been through some bad situations in my life. I’ve been in dark places. As, I’m sure you have. And up until the last several years, it was very difficult for me to overcome anything that was unexpected. It used to throw a wrench in my entire universe. But, the more confident I become, the more clear I get, the better I am at adapting to all that life has to throw at me, and actually, come back stronger than before. Let’s face it guys, we go through some serious pain on this journey we call life, right? We deal with bankruptcies, divorce, job loss, illness and injury, loss of a family member to the less serious things like a lawsuit, a shrinking timeline on a project at work, somebody cheats you, somebody steals from you and, of course, everything that comes between. Here’s what I see a lot of these days: obstacles, hurdles, road blocks, challenges, whatever you want to call them come up and instead of men facing these things head on and plowing through or going around them, they stop, hunker over in defeat, and tuck tail and run. Look guys, bad things are going to happen. Life is going to play out. Sometimes it’s amazing. Sometimes it’s not. If you run at the first sign of hardship, you’re weak and you’ll never measure up as the man you were put here on this earth to become. You won’t do anything worthwhile, you won’t get the girl (or keep her), you won’t get a promotion, you won’t start the business you’ve been thinking about for years, you won’t go run that marathon you’ve always wanted to. But, what will happen is you’ll settle in a job you hate, you’ll gain a few more pounds than you’d like, you’ll lose the girl, if you get her at all – and frankly you’ll live a sad little life. In fact, we see this a ton when it comes to the “failure to launch” syndrome – you know where 35 year old men are living in their parent’s basement, playing Xbox or Pokemon all day, and flipping burgers at Burger King the rest of your life. 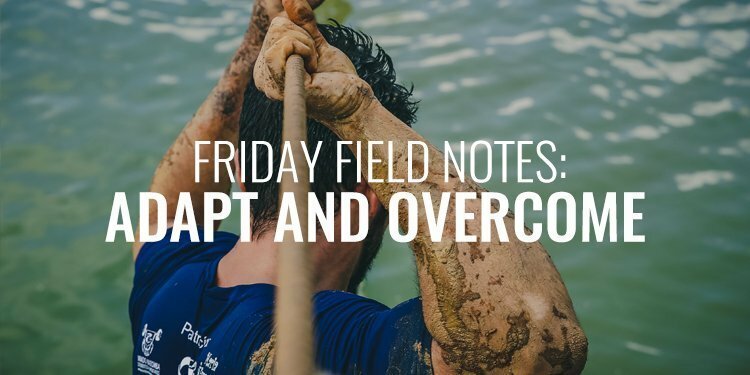 Now, you might hear that and think, “Ryan, that’s not me.” Good, I’m glad but the inability to adapt and overcome is something that happens to highly successful people too. Men get complacent, they think they have it all figures out, then something happens and it cripples them because they never built up the mental fortitude and resiliency to bear down and toughen up when that’s what the job requires. Alright, so you get it now. You understand this is some important stuff I’m talking about here. But, how do we do it? How do we build mental resiliency? How do we adapt for things we can’t predict? How do we overcome life-altering experiences? Guys, I know what this is like. I’ve left for Iraq when I was married for just six-month. My wife and I almost called it quits after five years of marriage. I’ve had failed businesses. I’ve struggled with my weight. These are all experience that all of us have or will face in our lives. So, the first step in this whole process is to reduce the number of unexpected events in your life. You’ve probably heard the quote, “An ounce of prevention is worth a pound of cure.” This is exactly what I’m talking about. But, how do you eliminate the unknown? You prepare yourself. You anticipate. You get ready. A soldier would never go into battle without training and you should never approach your life without some preparation. I’m talking about building up emergency funds and gaining new knowledge when it comes to your wealth. I’m talking about going to the gym and eating right when it comes to your health. I’m talking about constantly putting new information into that six inches between your ears so that you’re more equipped to deal with what life has to offer. I’m talking about making deposits into your relationships in the form of service so that when and if you need a withdrawal, you’ll have the emotional capital to request it. This is all part of knowing that life happens and it’s part of reducing the chances of you running up against obstacles. Next, don’t make emotional decisions. Look, I get it. When things go wrong – and the often do – we go into solution mode. There’s no problem with that except when we do it too quickly. What ends up happening is we make poor decisions because we’re operating from our emotions (typically fear and greed) instead of the advanced portions of our brain which is where we find reasoning and logic. Take a step back. Breathe. Assess the situation. And choose a course of action. Don’t compound the problem by making rash decisions. Now, this leads me to my next point which is to change the environment. If you find yourself in a tough situation, the very best thing you can do is to change the environment. This allows you to go back to the reasoning center of your brain instead of the emotional side of it. I hate to say, “find your happy place” but this is actually a legitimately good exercise. I’m not talking about your emotional happy place. I’m talking about a physical place you call your own. I’ve got a 1,300 square foot shop that is mine. Maybe your place is the mountains. Maybe it’s the shooting range. Maybe it’s the golf course. It doesn’t matter so long as you change your environment. This will allow you access to a new set of thoughts, ideas, and scenarios you can use to approach your dilemma. My next key is to take decisive action. Be intentional. Be deliberate. Don’t dip your toe in the water with your solution. Dive in head first. Do a belly-flop if you have to. There are too many men out there today who are timid. They’re weak. They take half-hearted measures. They don’t exert themselves fully. And, then they question why they’re experience half the results they thought they would. If you’ve used the previous keys I talked about, you can be decisive in your course of action. Now, don’t worry, because even if you get your action step wrong, you can still pivot to another solution. The best thing you can do is something. The worst thing you can do is nothing. Alright guys, when bad situations come up this week, I want you to use these steps. They’re not going to eliminate everything but they will help you build up mental resiliency and fortitude to face life’s woes like a man – on your feet. Really quickly, let me run through these again: prepare for battle, no emotional decisions, change your environment, and take decisive action. I guess this is as good a time for me to wrap this up and tell you about our mastermind group as any. You probably know by now but we’ve got an elite group of guys, 120 to be exact, that are taking this information to heart. They’re applying it in their lives. Their holding each other accountable. They’re taking calculated risks in starting new ventures. They’re taking control of their health. They’re reconnecting with their wives and children. And, they’re doing it through the frameworks and systems we’ve created inside The Iron Council. I’m encouraging you to join. I’m asking you to invest in yourself. I’m asking you to go above and beyond the conversation and take action on the things I know will improve your life. Head to www.orderofman.com/ironcouncil to join us. In the meantime guys, make sure you subscribe so you never miss one of these shows. I look forward to talking with you on Tuesday but until then, take action and live manfully!